How do I fix “could not activate cellular data network” problem when returning to US after traveling and using a different SIM card? 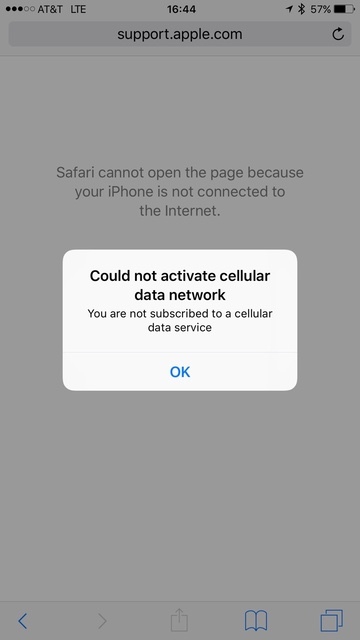 I tried the suggestions in https://support.apple.com/en-us/HT201415 and all of the suggestions in https://appletoolbox.com/2013/04/iphone-could-not-activate-cellular-data-network-fix/ except backing up and restoring, but nothing worked. I called AT&T and was asked to see if there is a profile at the bottom of Settings->General. There was, and deleting it fixed the problem. Apparently profiles are often installed when using overseas SIM cards. Not the answer you're looking for? Browse other questions tagged iphone cellular-data sim . Does trimmed SIM card affect iPhone 4S's signal strength? Can I tell if a device has an active Activation Lock before inserting a SIM card?